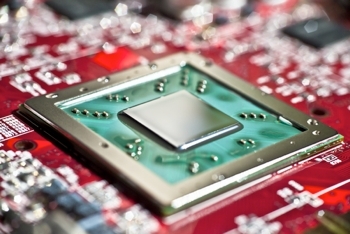 Jon Peddie Research (JPR) has published its third quarter statistics for the graphics processor market showing weak seasonal performance with shipments down 1.45% quarter-over-quarter and 10.8% year-over-year. The underwhelming results were largely blamed rocky PC shipments, which stems from factors including ongoing economic woes in the US and abroad as well as the increasing popularity of tablets. Discrete graphics shipments hit 34.3 million units, up 4.5% on-quarter, down 5.2% on-year and trending up with a CAGR of 2.6% by 2016. Of the three major graphics chip manufacturers, Nvidia made out the best with a quarterly increase in discrete desktop shipments of 28.3% as well as a 12% jump in discrete mobile shipments and an overall increase in PC graphics shipments of 19.6% (though it's down 0.5% on-year). AMD and Intel fared much worse. AMD's quarterly PC graphics shipments fell 10.7% (20% on-year), which includes a 30% decline in desktop APUs (CPUs with an integrated GPU) and a 4.7% drop in notebook APUs. Meanwhile, Intel's quarter-over-quarter shipments of desktop CPUs with integrated graphics fell 7%, notebook chips with IGPs fell dropped 8.6% and overall PC graphics shipments slipped 8%. Share-wise, Nvidia is still in third place with 18.5% (22.25 million units shipped), up 3.7% on-quarter, AMD stands at 21.2% (25.43 million units moved), down 1.5%, and Intel holds 59.8% (71.75 million units shipped), down 2.4%. The remaining sliver of share is split between VIA/S3 and Matrox, the former of which holds 0.4% of the market and the latter has 0.03% with less than one million units shipped combined.